Canada’s print media remained focused on the U.S. midterm election results while online, broadcasters featured a spark lit among protesters in Hong Kong. ISIS held its place in Canadian headlines but shared the spotlight with a recent report on the Catholic Church. 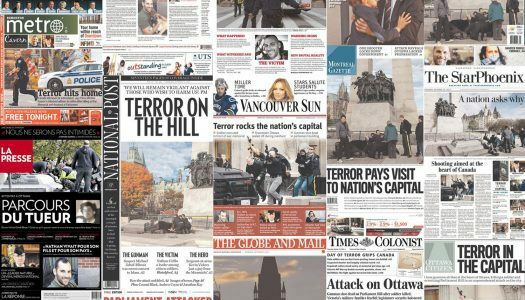 The shooting in Ottawa caused a ripple effect in coverage drawing much reaction from around the globe. Students at Toronto’s Humber College will provide ongoing reporting on how Canadian news outlets cover the world, as well as regular travel advisories. Like many foreign correspondents, World Report host David Common is always looking for creative solutions to the trickiest technical quandaries in the field. He explains how he worked during his recent trip to the Philippines covering the aftermath of Typhoon Haiyan. Applications for the R. James Travers Foreign Corresponding Fellowship are due Nov. 15. A unique convergence of some of the best investigative minds from across the continent is coming to Toronto Nov. 9 and 10 for a cross-border event co-hosted by the CAJ Educational Foundation and the U.S.-based Investigative Reporters and Editors.